Well, Siri tries to help you! But of course it is far from understanding what you exactly want. So, if Siri App Suggestions are annoying you, you can turn them off to disable the Siri suggestions in your iPhone. Learn the easy steps! All iPhone 4S and later users are familiar with Siri – the intelligent assistant that extends the functionality of your iPhone. With Siri, you can use your voice to operate the device and its apps. Siri can easily schedule events, set reminders, book reservations in restaurants and much more. You just need to speak to it! Siri also provides a group of app suggestions based on your location and few other factors. These suggestions appear on the lock screen at the bottom left corner. For example, suppose you are in the habit of checking your official email every morning when you wake up, the email icon will appear when you start your day. Besides the lock screen, the app suggestions appear on the app switcher and the Notification Center as well. However, the app suggestions are not always helpful and you may simply want to turn them off. So let us check how we can disable the Siri app suggestions. Depending on the iOS version that you are using, there may be slight variations in the options available on your device. Go to the home screen. Swipe from left to right or just pull the notification center down to access the Widgets screen. On the Add Widgets panel, locate Siri App Suggestions. Tap the red minus button on the left and tap Remove, as displayed in the below illustrations. Next tap Done to save the changes made. In some cases, the app suggestions may not disappear immediately after disabling it. If that happens, reboot your iPhone and check again. To again enable the app suggestions, you can return to the Add Widgets panel, and tap the green plus sign next to the Siri App Suggestions as displayed in the illustration shown below. 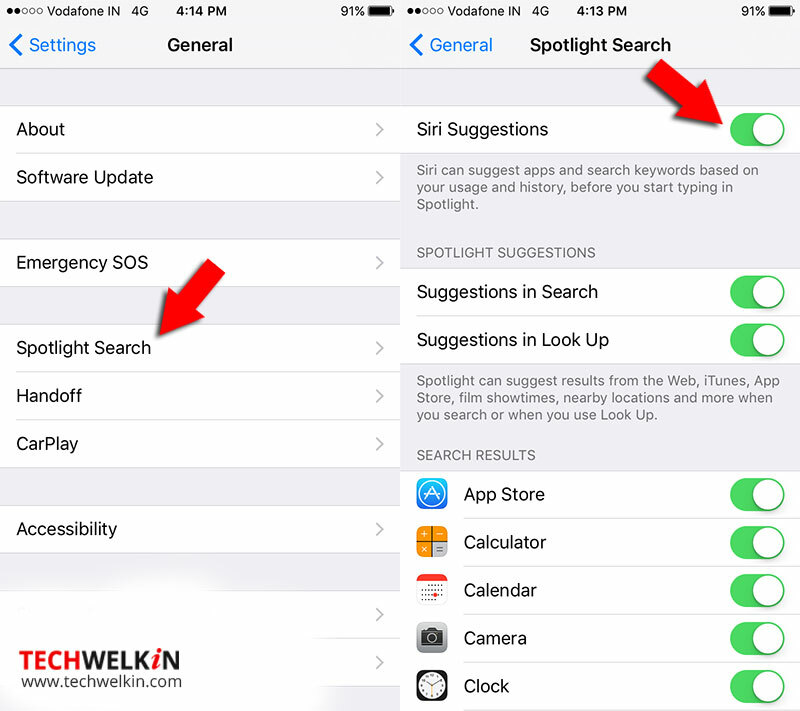 On your device go to Settings > General and choose Spotlight Search. Select Siri Suggestions and toggle it to OFF, as displayed below. When you decide to disable Siri Suggestions, remember that you have to disable it in the Widgets and Spotlight Search. You do not have the option to disable the suggestions in the Widgets but retain it in the Spotlight Search. You have to retain or disable both options together.